Curt and Mike, two of my sons, used to help me work on my rocket car, the Conklin Comet. When their school vacations rolled around, Ed and I would take them out on the road with us, which was quite the adventure for them. Curt was 14, and Mike was 16, and we’d travel from one end of the United States to the other on the racing circuit. Curt expressed the desire to actually drive the rocket car when he got older, but I had different ideas because of the dangers of high-speed racing. One day while I was at a scuba shop, a lightning bolt struck me in the head, as I happened to notice an aluminum backpack used to hold the scuba tanks. I immediately thought to myself, “Hey, what if a guy was to build a hydrogen peroxide rocket backpack?” Now don’t ask me why that question popped into my head, because what I’d ever do with it, I really had no idea, but? I decided to build it anyway, before somebody else came up with the idea. (Whenever I get a design idea, I always act on it right away while it’s fresh in my mind, since I don’t use blueprints of any kind.) I didn’t let on to anyone what my latest little project out in the shop was, and I wasted no time in starting on it. Because of the high heat of decomposing hydrogen peroxide, and the weight of steel, it was necessary for me to use stainless steel, so I machined the small 250-lb. thrust rocket from that, and then used an aerospace high-pressure vessel for the nitrogen tank. That was a good beginning, but I needed lots of stuff I couldn’t readily get my hands on. It just so happened that I actually knew of several places out in California where I could buy surplus aerospace hardware, which is what I needed. Believe it or not, it was actually a lot cheaper for me to fly out there and rummage around than to even begin to try to buy it new. So, that’s exactly what I did. I made the trip, found everything I needed, and headed back home to complete my little project. It ended up taking me about three weeks to get the backpack built, and by the time I finished, we were in the middle of a very long, cold Minnesota winter. There I was, all excited to test this little invention of mine, and it had to be cold and icy. I decided I wasn’t going to let that stop me, so I got on the horn to Ed and another friend of mine, T. J. Snow, and asked them both to come over and give me a hand firing the rocket. Let me tell you that even a true Minnesotan doesn’t come out of a good hibernation without good reason, so I gave them both just enough of a description to peak their interests, and it worked. My plea for help was answered. They both arrived in a very short time, and we headed out to my shop for the big “unveiling.” Of course, as usual, I had a plan, which was to strap a backpack to the telephone pole out in front of my house for its first test. Just as we were doing so, Ed says to me, “What’s the matter, Ky? Don’t you trust your own workmanship? Are you scared of it or what?” I looked up at him, caught him smiling a very playful sort of smile, and I unstrapped it from the pole. “You know, Ed,” I replied, “You’re right. The heck with this; go ahead and strap it on me, man.” “Ky, I was only kidding ya,” he said, but I continued, “No. Let’s just do it. C’mon,” so he complied with my wish, and onto my back it went. Nicely, tightly, secured. I have to admit that while I was playing the cool cucumber, I was more than a little apprehensive about how this was going to turn out, but I never let on. He goes, “Well? Now what? Where are you going to go with that thing?” I looked up and down the road, but that just didn’t seem like a good idea at the time. Then I got my next brilliant idea. Strutting like a peacock, I walked from the telephone pole over to the long stretch of sidewalk out front that just so happened to have a real thin coat of ice on it. “Right here!” I announced. “I’m going right down this sidewalk, guys. Are ya ready?” “You’re the man, Ky. Just go for it when you’re ready, buddy. We’ll be right here!” Ed said, and they both started snickering as they followed along behind me. Traffic was cruising right along on the street in front of my house, and there I was—a grown man standing on an icy sidewalk in the dead of winter with this never before seen rocket-powered backpack strapped onto my back. Did I care? No. I was ready. I said, “Okay, here goes nothing,” and I slowly opened the hand-held throttle valve. The hydrogen peroxide flowed into the rocket chamber, and all of a sudden this ear piercing sound came out of the rocket nozzle, and the rocket came to life and started pushing me down the sidewalk. It felt like a giant man pushing on my back. I had to crouch down so the rocket wouldn’t push me over. Those guys started screaming with laughter. I couldn’t BELIEVE how much power this thing had, and how well it worked! I was gone. That was it. One of the most awesome little rockets ever made, and I had invented it, and it was FUN. I knew if I thought this was fun, my son, Curt, a natural hockey player and darn good skater, was going to go absolutely nuts when he got a load of this, so I literally ran into the house to get him to come out and check it out. He was game, no problem. Instead of using the sidewalk again, we decided to give this thing a try on something a LOT more fun—the small, frozen lake out back. Curt tied on his hockey skates, and we strapped the backpack snuggly onto his back. I showed him how to work the throttle, and gave him some last minute instructions, and he was ready. He actually added his own twist to the performance by first skating as fast as he could, and then he crouched down and slowly opened up the throttle. I’m tellin’ you; he took off like a human rocket over the lake, and he actually made it all the way across before he ran out of rocket fuel. I thought to myself how the neighbors on the other side must have been wondering what kind of an unknown speed skater lived in the house across the way, and just how the heck he had just done what he did. He looked like a cannonball being shot from a cannon. It was absolutely awesome, and I was in awe standing there watching my son having the time of his life. He skated back with the biggest smile on his face, and excitedly announced to me, “That was AWESOME. Hey, Dad, I want to do this on roller skates at drag strips!” Ah HAH. I thought that was an absolutely great idea. Curt really had something there, and he looked really good while doing it. Ed and T. J. agreed, so I told him I’d definitely check into it. We got everything packed away in the shop, and I thanked those guys up and down for all their help. That was a very memorable cold, winter’s day, to say the least. As soon as I got back inside, I headed right into my office and called my booking agent, Duane Nichols. I told him what we had, and asked whether or not he thought it would be possible to add Curt to our bookings at the same drag strips where we ran our rocket car. He said he’d definitely see what he could do, and he’d let me know. Curt was as anxious as I was to hear back from Duane, and it didn’t take long. He called me back the next day with great news. Sight unseen, he already had a number of track owners who wanted us right away, but they wanted to know how fast it would go. Well, I really didn’t KNOW how fast it would go, but I quickly replied, “Trust me, Duane. It will go faster than anyone has ever gone on roller skates before.” He replied with, “Okay, you’re right, you’re right. I’m convinced. Just one more thing, though, Ky. What are you going to call Curt? He’s going to need some sort of a show name.” I said, “Hmmm…good point. Okay, wait a second,” and just then I remembered an action-packed movie called “Rollerball,” so I came up with the name, “Captain Roller Ball.” Duane loved it, and told us he’d get us booked, no problem. I’ll never forget the look on Curt’s face when I told him he was now going to become the famous “Captain Roller Ball.” He was in Heaven, and now neither of us could wait for winter to end. It was one of the longest winter’s I can remember, but we stayed busy preparing. Curt took this opportunity very seriously, and he spent many hours practicing skating with the 40-lb. backpack on his back until he learned how to completely balance with all that extra weight. As soon as the snow melted, he practiced in the school parking lot making slow speed runs with his school buddies looking on. It wasn’t long until he made a high-speed run before his school teacher and all of his classmates, and they all thought he was really something. I couldn’t have been happier for him, because I could clearly see how much enjoyment he took in this little sport of his, and I knew he’d become somewhat of a celebrity because it was something so unique and so different. As Curt practiced, I had my friend, Jim Deist, sew up a yellow and blue cape, and a flashy silver fire suit, just like the top fuel racers use. This was back in the early 70s, so there was no such thing as roller blades back then. He had to use the old-fashioned, four-wheel roller skates, and for night appearances, I fastened flashlights underneath them so he could see any debris that might be in his path. His first “professional” appearance was at an annual event called Oktoberfest over in La Crosse, Wisconsin. The racetrack is fairly large, and the event is well known and attended by thousands of people. When we arrived, there was a grandstand FULL of “festers,” and he was fighting chilly nerves on a very chilly October day. I gave him a pep talk and got him as fired up as possible, and he hit the track, uncertain of what lie ahead. He had his fire suit, cape, and helmet on, and the crowd was totally into it. They weren’t sure what exactly they were looking at, but it definitely looked interesting, and they were behind him all the way. He took his position, started to skate, and when he hit the throttle he was clocked in at 30 mph on his first run. He received his very first standing ovation from the crowd that chilly October day, and from then on, he WAS Captain Roller Ball, the showman. After that, no matter where we traveled, the rocket backpack and my son were the talk of the town. People found Curt’s stunt to be more than a little odd, but very, very fascinating. It wasn’t long before he earned his place in the record books with speeds in excess of 50 mph. The best part of the whole deal for Curt was that he started earning $350 per appearance, which was a heck of a lot of money for a 14-year-old kid. By the time he was making all these appearances, I had decided since I was building rocket-powered vehicles for other people nearly every winter, it was time to just start my own booking company, so I did. I called it Space Age Racing, and expanded on not only building cars, but then got the bookings for them, as well. In return for my services, the vehicle’s owners would pay me 15% of their gross profit. So you do, of course, realize that even though Curt was my son, he still had to pay me the 15% booking fees for all the shows I lined up for him. After all, I was teaching him responsibility, and how to be as “enterprising” a guy as I was. Lessons like that just don’t come cheap, ya know. All kidding aside, I was very proud of him, and I knew he appreciated the opportunity I had given him. He started receiving a lot of national attention through magazines, newspapers, and television; news of Captain Rollerball traveled fast. It just so happened we were racing down in the New York area when we received an invitation to appear on the “Mike Douglas” show, which back then was the equivalent of “The Tonight Show with Johnny Carson.” Since we were in the area anyway, and this was just a wonderful opportunity, we accepted the offer and headed down to Philadelphia to tape the show. We were thrilled at meeting celebrities, and were honored to learn we’d be appearing with Mike Connors and comedian, David Brenner. Now for our segment, Mike actually suggested we also have David Brenner try out the rocket roller skates live on the show. Man, for some reason to me that just sounded like an accident waiting to happen, so I asked David if he would like to take a practice shot at it first. He said he was a darn good skater, and he really didn’t need to practice. He just looked at that small rocket backpack and laughed in confidence. I had it figured differently, though. He looked to be having much too much fun entertaining a couple of girls he had just met, which is why I think he declined. So, as the segment was about to go live, I left him with a little advice. I told him, “David, whatever you do, do NOT fire the rocket wide open until you start skating first.” He assured me he wouldn’t. While I had been talking to David, Curt had gotten ready. He put on the rocket, skated down the alley in back of the studio, and fired it. They had a couple of guys holding a big mattress at the end of the block to stop him from flying through the intersection. He looked great, it looked easy, and everyone was impressed with his performance. That was Curt…now it was David’s turn. We got David all strapped in, and right off the bat, he started joking around with Mike by saying, “How far is it to the Manhattan toll bridge?” Mike replied, “Here, I have some coins,” and handed him 75 cents. Just then, David began jumping up and down on the skates, and started to pull the lever that let the rocket fuel flow into the motor. He let just enough in to make the motor go pop, pop, pop, and then started to dance up and down jokingly like the rocket didn’t have enough power to push him. From there, he did exactly what I told him not to do. He powered the rocket wide open without skating first. The rocket literally catapulted David straight up into the air, arms just flailing everywhere, and he came down hard, flat on his face. It was a miracle he wasn’t seriously hurt. We all gathered around to provide medical attention, if needed, when David rolled over and said, “Am I there yet?” That was so typical of him…everyone, of course, burst out laughing, and when it was all over with, the producer said it was definitely a very entertaining, good segment. I know I’ll certainly never forget it, and neither will Curt, who continued to appear at racetracks for the next couple of years thrilling the crowds with his high-speed antics. 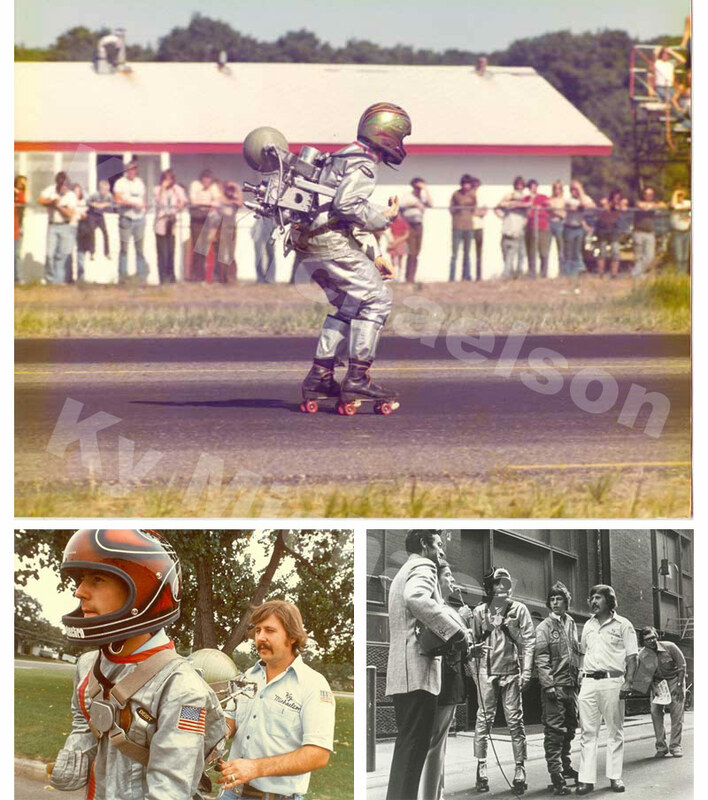 He was never injured, never fell, and will go down in history as the first rocket-powered roller skater, setting the speed record at 52mph in 1976. I’m proud to say that Captain Rollerball lives on.